Sauria : Lepidosauromorpha + * : Protorosauridae + (?Choristodera + ?Helveticosaurus + ? ?Chelonia (according to molecular phylogeny, otherwise Anapsida or Lepidosauromorpha) + (Rhynchosauria + (Trilophosauria + (Prolacertiformes + Drepanosauridae + Archosauriformes)))). 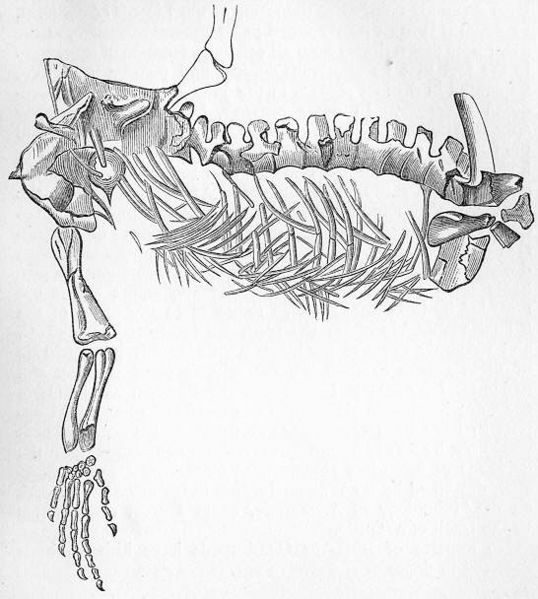 Cervical ribs with 2 heads; concave-convex articulation of astragalus & calcaneum; premaxilla extends dorsally behind nares & excludes maxilla; teeth in sockets; neck with 7-8 vertebrae; centra not deeply amphicoelous; pisiform usually absent in carpus; primitively, calcaneal tuber extends laterally beyond articulating surface of calcaneum (pulley for gastrocnemius – more upright position?). Protorosauridae: (= Archosauromorpha?) Protorosaurus, Czatkowiella. Middle Permian to Early Triassic of Europe. Archosauromorpha : ?Choristodera + ?Helveticosaurus + ? ?Chelonia + (Rhynchosauria + Trilophosauria + (Prolacertiformes + Drepanosauridae + Archosauriformes)) + * : Czatkowiella + Protorosaurus. Protorosaurus: Protorosaurus speneri von Meyer, 1830. Protorosauridae : Czatkowiella + *. From Zittel/Eastman/Woodward 1902 (copyright expired) "Attaining a length of 1.5 m. Vertebral centra completely ossified, and united with their neural arches by suture. Intercentra occur only between the cervical vertebrae, which are elongate, and bear slender ribs. Skull tapering anteriorly, its structure not clearly shown.Hind limb considerably longer than the fore, and distal tarsals less than five in number. Upper Permian (Kupferschiefer) of Thuringia and Hesse, and Magnesian Limestone of Durham, England." Comments: The earliest known Archosauromorph. Although frequently illustrated as a complete skull and skleleton, or life reconstruction, and often mentioned, this is a poorly known form. Included first in the Euryaspida, later in the Prolacertiformes. Although similar to Prolacerta, there are many aspects of its anatomy that are still controversial (Benton 1985), and it may have a more basal position. (Borsuk-Białynicka & Evans, 2009). Although usually reconstructed as semi-aquatic, these animals were more probably fully terrestrial, very similar in lifestyle and appearance to extant monitor lizards (Varanidae). It is quite likely that the Protorosaurs and Prolacertifomes simlarily used gular pumping of the hyoid skeleton to ventilate the lungs more efficiently. (Dr John Merck - Archosauromorpha). The life- reconstruction of Prolacerta at the top of the page could equally apply to Protorosaurus or the related Czatkowiella. Czatkowiella: Czatkowiella harae Borsuk-Białynicka & Evans, 2009. Protorosauridae : Protorosaurus + *. long slender neck, three headed ribs on some anterior dorsal vertebrae, and short broad neural spine tips in the dorsal vertebrae. Comments: resembles Protorosaurus but differs enough to justify distinct generic status. Both show diagnostic long-necked "prolacertiform" characteristics (loss of the parietal foramen, distinct transverse processes on the dorsal vertebrae, double-headed ribs), but cladistic analyses does not recover a monophyletic Prolacertiformes. Czatkowiella and Protorosaurus represent basal archosauromorphs with few specialised or common characteristics; the traditional prolacertiforms, like the younginiformes, probably represent a basal assemblage grouped together because of shared primitive (plesiomorphic) characteristics the retention of primitive character states. If ichthyosaurs, sauropterygians, and testuduines are archosauromorphs, they would derive from this early evolutionary assemblage of long-necked lizard-like forms. References: Borsuk-Białynicka & Evans, 2009.